From My House : snipping, chopping, lopping, and pulling. snipping, chopping, lopping, and pulling. These OMG-sized junipers are being cut. Then we will pull out the rest of the plant - roots and all. My dad planted these junipers and I guess when he died, that last year, mom just let them grow out of control. They are waist high. They basically are a Hotel for Spiders. A couple of years ago, my husband cut them in front, and we had bare branches until this year. I kept wanting to spray paint them green, they looked so bad. We have to be careful when we pull the plants out - their roots are wrapped around, our irrigation pipes. 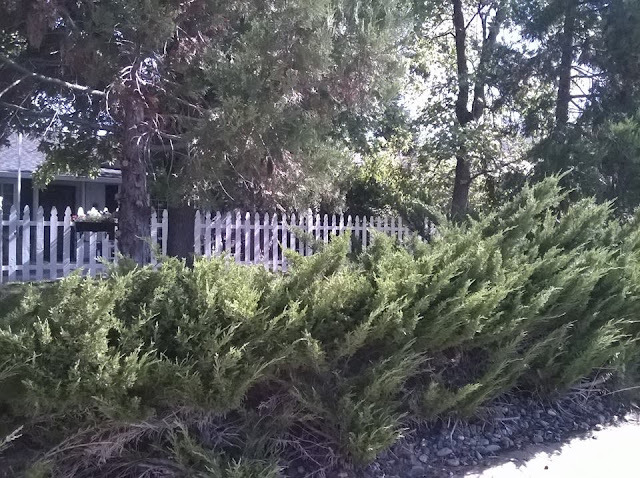 Many years ago I had to pull out overgrown junipers from the front of the house. A friend came over with his pickup truck and pulled them out. I do not understand why professional landscapers pick plants that will outgrow their allotted space. We'd do that, except it would break the irrigation system. My dad planted these too close to the sidewalk and they used to take up half of it until my husband butchered them back. How precious that your father planted these and you and your mother want to hold onto them. Our family also has sentimental plants, flowers, and trees just like that.